This post has been updated (27/6/2017). 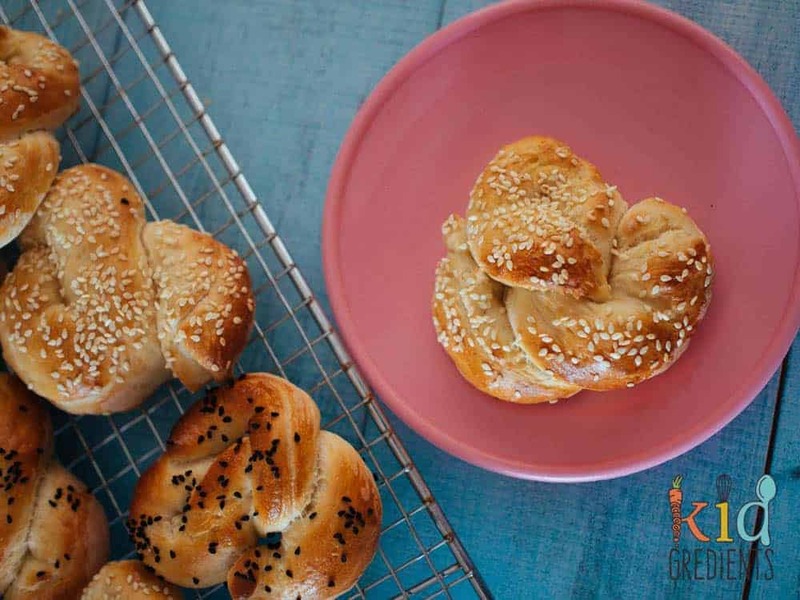 A friend of mine, Amanda from Cooker and a Looker asked on facebook today for a recipe for pretzels. I sent her the very traditional German ones I had seen online then remembered this post of mine. 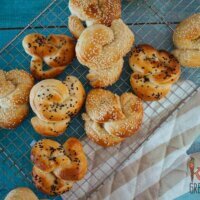 When I added the link to these savoury easy bake pretzels, the image popped up and they looked terrible! So I thought I would breathe some new life into these and bake a batch today. I’ve also adjusted the instructions a little as I made 12 mini ones- I’ll be sending some in lunches tomorrow. These are so easy to make, and really good fun, so if you’ve got kids at home for the holidays, this would be a great activity to do with them! can you smell the fresh baked yumminess? 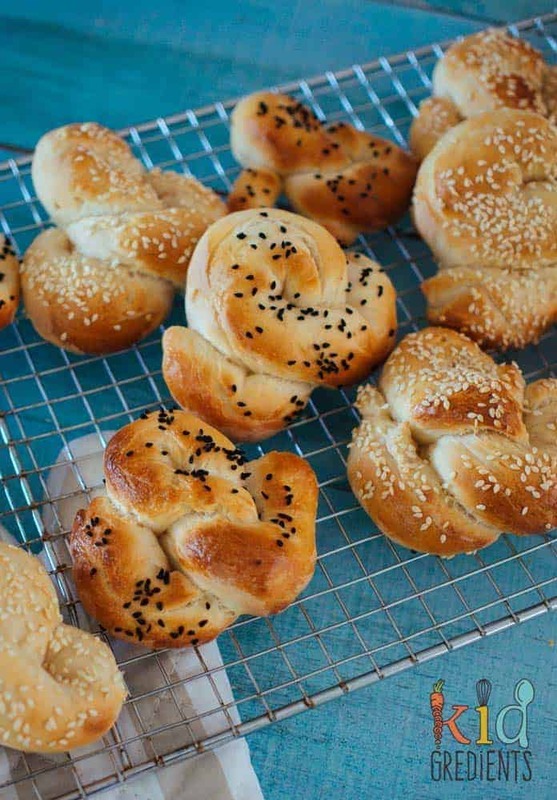 Pretzels, doughy, soft and savoury are a bit of a hit around here. We had them once at the shops a while back when Master 2 was being particularly whingey. Miss 4 LOVED it. So much so that I almost went back and bought a second one. go on! I dare you to stop at one! No need to buy them though, they are so quick and easy to make. Even if you are a baking-a-phobe, these are achievable. I promise. And they are so versatile. I’ve done this batch as savoury, but you could easily do sweet ones. I’m thinking these are going to become a bit of a staple. They could also be made a lot smaller than I made these. I got 8 out of the dough, but you could possibly go 12 or maybe even 16 from a batch of dough. They freeze well and they are ideal lunchbox fodder. You could even have these with soup or dips. Gosh. I’m gushing. But they are so good. Ok. So before I keep going on and on…I’m just going to type the recipe. nigella seeds or sesame seeds? 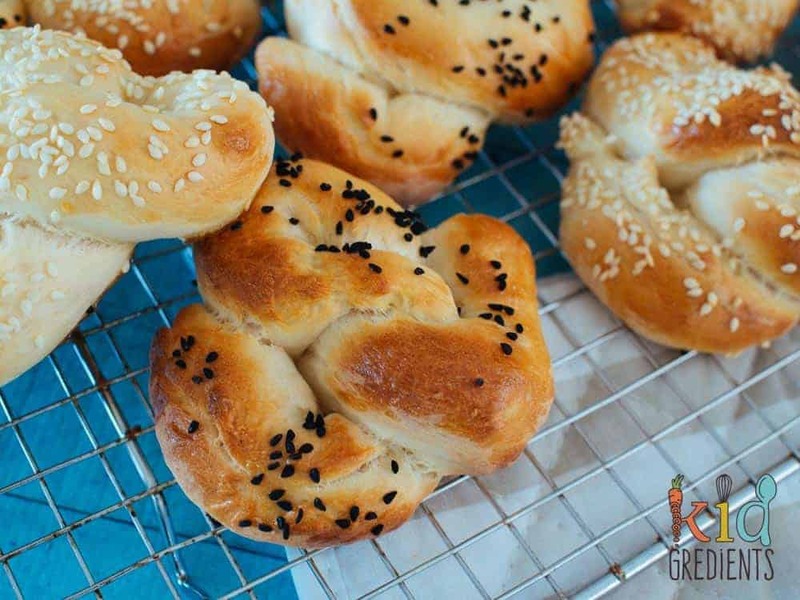 Savoury easy bake pretzels, easy to bake, perfect in the lunchbox or even as afternoon tea. Eat them straight, or spread with your favourite spread. 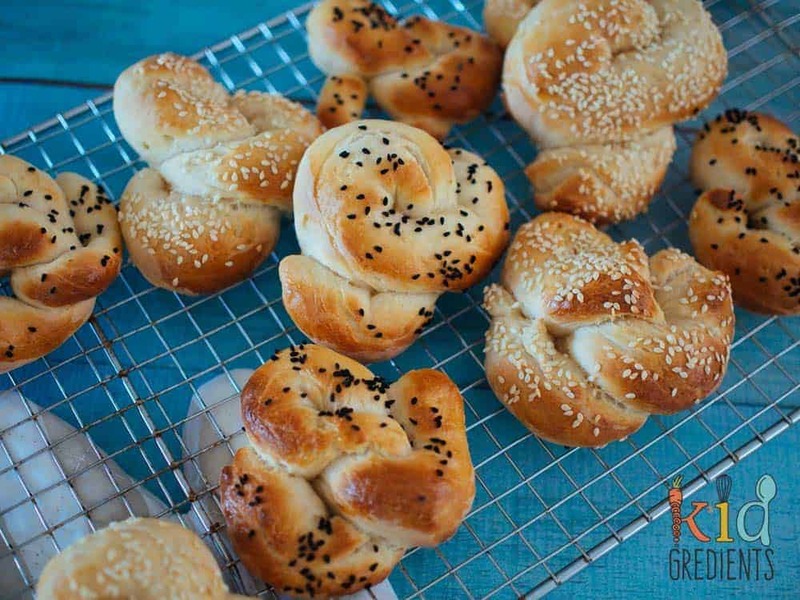 Freezer friendly, kid friendly and the perfect way to try baking bread. Add the water, sugar and yeast to a jug and leave to sit for 1-2 minutes. Put the flour and salt together in a bowl and mix well. Add the wet to the dry and mix in a mixer on low speed with a dough hook for 2 minutes, then high for 5 minutes. (you could knead by hand for 10 minutes, but I'm too lazy). The dough is ready when its stretchy and glossy. Put the dough in a lightly oiled container and cover. Leave to rise for 1 hour near your oven that you need to preheat to 220 degrees. Roll each portion into a bowl then roll with your hands into a long sausage. 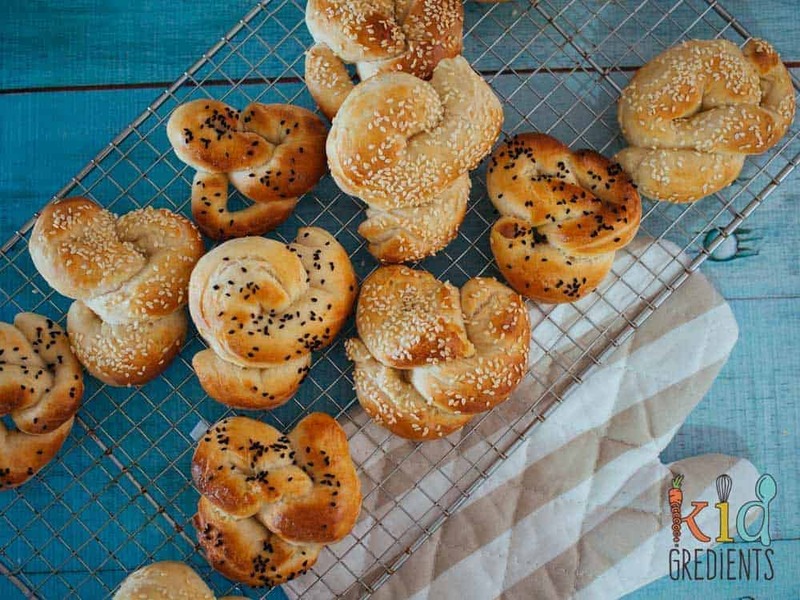 Get creative tying knots in the pretzels! Brush with the egg yolk mix and sprinkle with the sesame seeds or nigella seeds. Bake at 220 degrees for 10 minutes (for 12). Adjust the time down if you are making them smaller.